Sias’s original concept was for a somewhat smaller boat than the final design. He wrote up the specifications and sent them to several naval architects on the East and West Coasts. They were difficult specifications and when Ben Seaborn received them, he threw them in the “round file”. Seaborn later retrieved the discarded specifications and sketched a proposal for Sias, enlarging the size of the boat somewhat. Ed Hoppen, the boat builder in Gig Harbor who built the first Thunderbirds, had long had an idea of building a boat by setting up plywood molds and utilizing stringers much in the manner of a model airplane. His ideas and those of Sias and Seaborn came together in the first Thunderbird meeting. Hoppen persuaded the others to let him use his idea. At this point, Seaborn provided a profile drawing showing the chine location and an arrangement, but no other lines. Using this Spartan design, Hoppen produced two solid models to develop the lines and a balsa model to show an interior layout suggested by Bob Price, a Tacoma architect. Seaborn’s original sketches showed the present reverse transom but plumb, reverse, and conventional transoms were all tried on the solid models. The reverse transom was most pleasing and was selected. The first Thunderbird was lofted from the model lines. Ed Hoppen points out that one of the difficulties of this type of construction is that all interior layout has to be predetermined before the molds are cut out. This design effort made the first thunderbird a very expensive craft. The first boat had T-section stringers. Plywood construction resulted in more rigidity in the hull than had been expected and subsequent boats used the plain stringers of the ultimate design. The original craft also had deck beams in the side decks. Hoppen recalls that he would fit one of these and the one before it would slip out. This difficulty led him to invent the ingenious box beams which are in the final design. Other areas where a lot of design effort was expended were in the motor well and in the hatch. There were three attempts made at getting a proper keel mold. The keel design is the same as the Sierra design but has a different appearance because the Sierra keels were never properly made. The Sierra was an earlier design by Ben Seaborn which is very similar to the Thunderbird except done in conventional plank construction with out the hard chine. The first Thunderbird was launched in November of 1958 and two more followed from Hoppen’s shop in February of 1959 and August of 1959. Hoppen stated that he and Phil Manley, one of his shipwrights, made most of the decisions on construction details as they went along. The plans with which we are familiar with today were drawn from the second and third boats. Hoppen took two truck loads of patterns to Ben Seaborn’s office in Seattle where the plans were made directly from these templates. The plans originally sold for $2.00 a set. Ed Hoppen and a ghost writer wrote the instructions after the fourth boat was built. 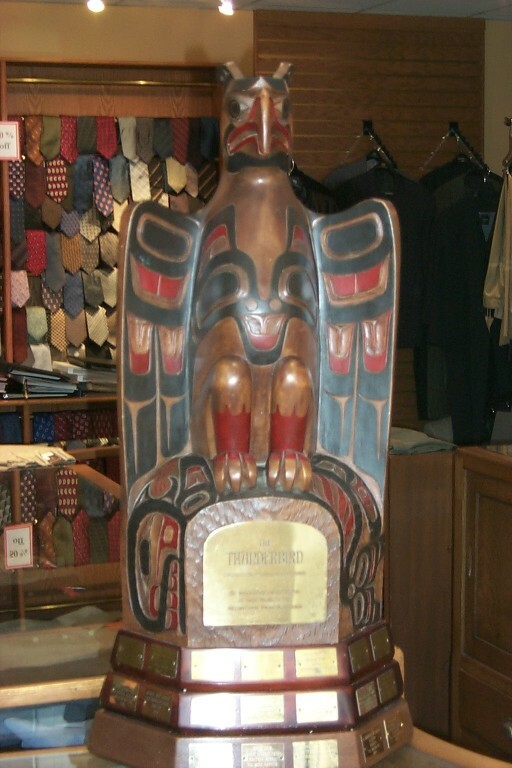 Bob Price suggested the name “Thunderbird” as indicative of the Pacific Northwest origin of the boat and Walt Hanson of Tacoma designed the unique thunderbird insignia after some research. Several meetings of boat owners and potential boat owners held in 1959 and early 1960 led to the formation of the International Thunderbird Class Association (ITCA). Tom Wile was elected as the first ITCA President. An International Constitution and Specification was prepared and the first two fleet Charters were issued to Tacoma as Fleet #1 and Seattle as Fleet #2. Interest in the Thunderbird quickly spread to other parts of North America and the world. Fleets soon formed in Victoria and Vancouver British Columbia, Toronto, Massachusetts Bay, San Diego, San Francisco, and Sydney Australia as well as other locations in North America, Australia, and the Pacific Basin. The ITCA published the now famous Black Book listing the specifications for the Thunderbird design. With periodic updates to keep the boat both modern, competitive, and affordable, periodic updates and changes have been made to the Black Book which has allowed the Thunderbird class to stand the test of time. More than 25,000 sets of official plans have been distributed over the years. By the late 1960’s, fiberglass was becoming an increasingly popular sailboat construction material and aluminum was replacing wood as the mast material of choice. At the the same time, further development in hydrofoil design was pointing towards the value of a higher aspect ratio rudder. The leaders of ITCA recognized that in order to maintain broad appeal for the Thunderbird, the class needed to find ways to incorporate these new materials and ideas into the Thunderbird design. John Booth of Victoria built the first fiberglass Thunderbird (#1000, Freeway) for Glen Higgins in 1971. Aluminum masts were introduced at about the same time. The class adopted an alternative high aspect rudder designed by Pete Gilson of the Massachusetts Bay fleet. Another design innovation developed by John Booth in the late 1970’s, the optional “cruising deck” added slightly more crown in the deck for greater headroom and additional length to the cabin for more cruising comfort. The Black Book was carefully revised to incorporate all of these changes while maintaining the essential character of the Thunderbird. Jim Lane of Tacoma produced fiberglass production Thunderbirds in the 1970’s after taking a mold from hull #2, Pirouette. Harry “Tanker” Jones took a lane boat home to Whitby, Ontario, created molds and began making fiberglass Thunderbirds. His operation was eventually taken over by Rick Bott of Toronto. Another Lane boat was taken to Australia in the late 1970’s by Laurie Schneider, who also created molds and began producing fiberglass boats in Sydney. Bruce and Les King of Geelong have constructed two International Champion boats #1224 Thunder Down Under and #1255 Predator, from those molds. The first Thunderbird International Championship regatta was held in Seattle in 1966. The winner, Bob Johnson sailing #24 Takoa, claimed the magnificent newly carved perpetual trophy for the San Diego fleet. Two years later, Tony Redstone of Sydney Australia won the Internationals in San Diego sailing on a loaner boat. John Malleson of Victoria (#900, Sunday) became the first Canadian champion. The International Championships are generally held every two years. Today, the ITCA continues to make small innovations to the design which helps the class stay modern and competitive while retaining the strict one-design characteristics that have allowed the Thunderbird Class to flourish.